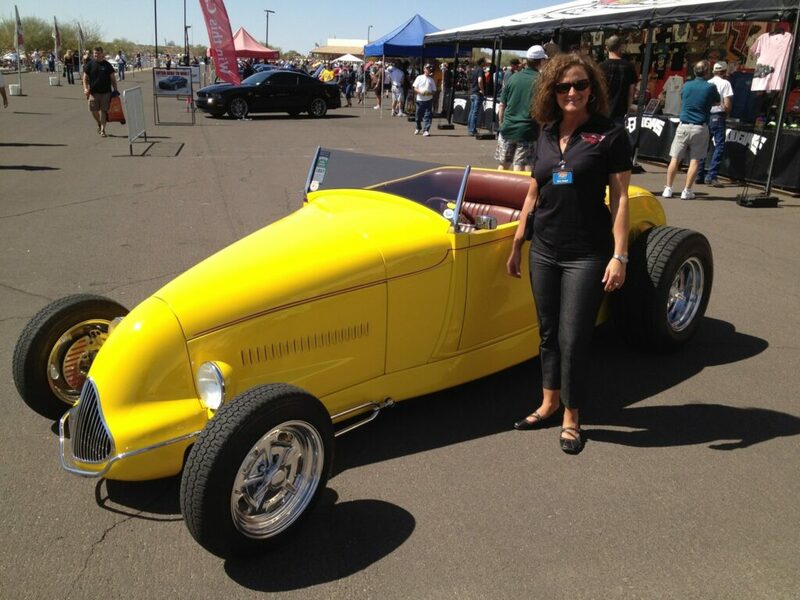 Betsy Bennett with Gary Meadors bright yellow ’29 Ford roadster. The people behind the scenes, making car shows, races and events happen, often get overlooked, but without their expertise in the field, none of our favorite entertainments would be possible. 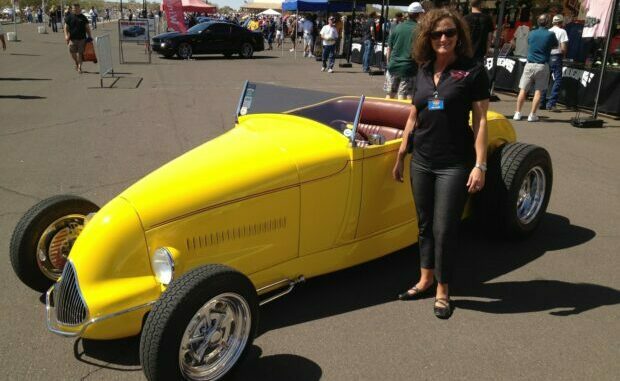 We spoke with Betsy Bennett, Communications Director for Goodguys Rod & Custom Association, about how she got her start, what she loves about the industry and what it was like to be part of the development of such an iconic organization. 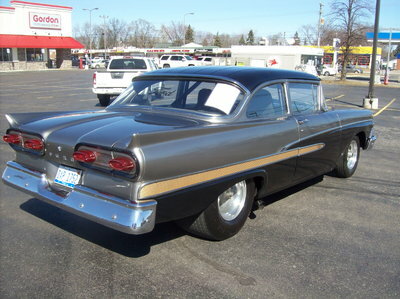 Goodguys is known for its national series of car shows, promotion and support of the collector car hobby and of vintage style nostalgia drag racing and auto-cross. The company started in 1983 with a local car show in Pleasanton, CA where the organization is based, and expanded to a 10-show series of events in 1987, growing from there to host 19 events in 11 states. RJ: How did you get your start in the auto industry and with Goodguys? BB: I grew up outside of Indianapolis. I loved cars and racing and after I graduated from college, I went to work for the Promotion Company and Special Events (now Family Events) working on all of their big events. I loved the events business and when you combined it with cars, it was so fun for me. I went to one of the first Goodguys national hot rod events in August and it was such a fun, cool event that I kept an eye on the organization. Eventually, I decided to move to California, and I called Gary and Marilyn Meadors (of GG) and said I was moving and asked if I could come talk to them. Gary wanted to hire people to help build the national events. He told me they were going to work hard and offered me a job, but said they needed me to start on January 1st. That was early December of 1990. I thought about it, and told them I’d do it. I remember thinking that Gary had a vision, and was so brilliant about the way he saw events. The people were what fascinated him. It’s the coolest thing ever — each car comes with a story, a history and a family and that’s what Gary saw in it. For me, it felt like a perfect fit. RJ: Did you race as a kid or just attend races? RJ: What were the early days at Goodguys like? BB: We learned all different parts of the job, from ticket sales to promotion. If you needed to sell shirts, you did. Same with tickets. When we started out, Gary ran the events. If he told you to do something, you did it. RJ: When Goodguys started to grow, how did your role change? BB: My role was initially vendor sales. My degree from Purdue was in marketing and PR. I’d work on the media stuff with Gary and on other projects, and tag team with John Drummond on PR. Gary suggested that I run some of the events, and I did. It turned out, I loved event direction. It’s like taking a giant box of puzzle pieces and making them work together. RJ: You’re career with Goodguys has really represented a lot of longevity. How have those career changes happened? BB: With a lot of encouragement from the other people in management. When I was first approached about taking over the public relations for the whole company, my first reactions was, “that’s such a big job, I don’t know.” I was comfortable doing event management. But the encouragement I received really helped me see that I could do it. It’s a different part of the business, but it’s a great challenge. RJ: What are some of your favorite parts of working in this area? BB:I love finding local stories and participants, people who have amazing histories with their car. I love the challenge of getting the media to the events, getting what we are doing covered. RJ: What are some of the stories that have stuck with you? BB: One of the things I remember, at a show in Iowa 10 years ago, was a dad, grandfather and son all had cars there that had won awards and they’d all worked on them together. It was one of the coolest things I remember. The magic that Gary always saw was that cars connect us. 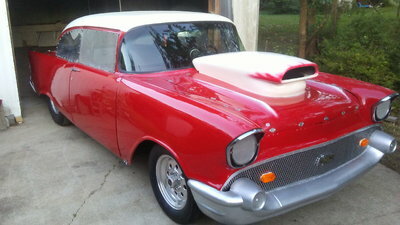 I also love running across stories about cars that aren’t in production anymore and the people who have restored them. It’s the personal aspect of the hobby I find so appealing. RJ: How has communication about the events changed? BB:Social media channels are hugely important, down to communicating with journalists who are also on social media. We used to physically mail photos and press releases, call reporters. Now we shoot off an email. People are less willing to take a call about a pitch, so we have to figure out different ways to connect with them. RJ: How has this effected your participants and spectators? BB: We run huge digital ad campaigns in the markets. We communicate with our registrants electronically. Technology pushes us forward. But we still have the guys who mail in their forms and photos. RJ: Speaking of changes, what sort of changes have you seen in the industry over the years? BB: A lot of the events business has stayed the same: the core is people who love cars. The challenge is how to create a platform for people and entertain them. That ties into our most recent expansion of the cutoff year (to 1987). That’s been cool to see. I was here with the cutoff was ’62. The big shift then was the muscle cars. Prior to this most recent expansion, we hadn’t had an expanded cutoff shift in 20 years. We’ve been happy to see more of the newer cars and their owners. 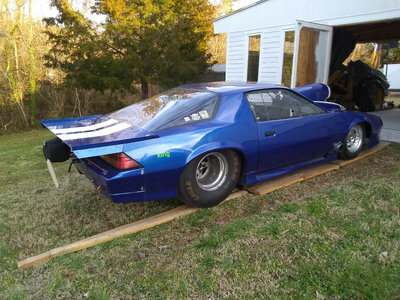 It allows new genres of cars and allows others to get into the car hobby without it being cost prohibitive. When we expand the cutoff year, it takes a few event seasons for it to take hold. We’ve been happy with the positive response. RJ: Since this interview is to celebrate women in the industry, what advice would you give to other women in automotive? BB: The thing that helped me the most when I started working with Goodguys was that Gary and Marilyn were a force together. They mentored us and guided us. Having a mentor early on in the industry, someone to lean on, is huge. If you want to do it, just go for it. It’s such an incredibly interesting business to work in. I love combining the business side with the stories from those who are hobbyists. I think it’s an amazing industry to work in. I never get tired of going to an event day and seeing what there’s going to be to see.